A survey conducted by Asianet News and C-FORE polling agency ahead of upcoming assembly elections has revealed a dramatic shift of Hindu votes away from the Congress-led United Democratic Front towards the Bharatiya Janata Party. 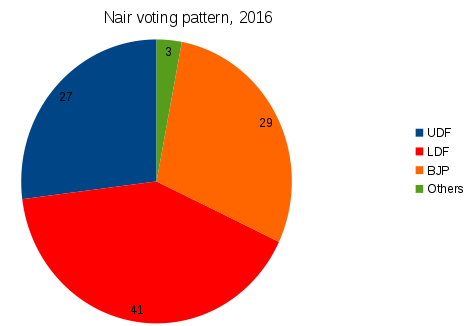 The BJP is set to triple its vote share to 18% from 6% five years earlier, the survey found. The emergence of the BJP has, however, not hurt the base of the Left Democratic Front, indicating that it is the relatively well-off Hindus — who traditionally favored the Congress — who have shifted alliances. The numbers suggest that the saffron party’s old strategy of trying to displace the Left and position itself as a ‘Hindu’ alternative to the ‘minority-controlled Congress’ has been a failure, but it could end up displacing the Congress in Kerala. Indeed, the BJP seems to have realized this soon after the local body elections conducted in November, and has been redrawing its strategy in Kerala — moving away from being a ‘Hindu’ alternative to the Congress to a ‘development oriented’ alternative to the Left. On an overall level, there has been an 9% swing of votes away from the Congress party, and all of this swing can be accounted for by the movement of Hindu votes away from the Congress-led combine. Till the last election, the UDF used to get about one third each of its votes from Hindus, Muslims and Christians, adding up to 15% plus 15% plus 15%, taking the total to 45% of the electorate. However, according to the latest pre-poll survey, the UDF’s vote share is set to decline to 37% from 46% five years ago, a drop of 9 percentage points. 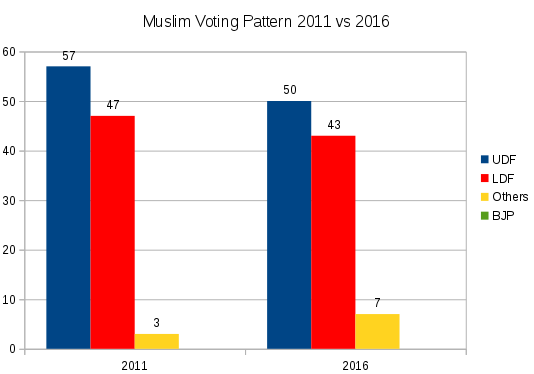 Nevertheless, the proportion of Muslims who vote for the alliance continues to remain at 50%, while the proportion of Christians who vote for the front also remains robust at 66%. 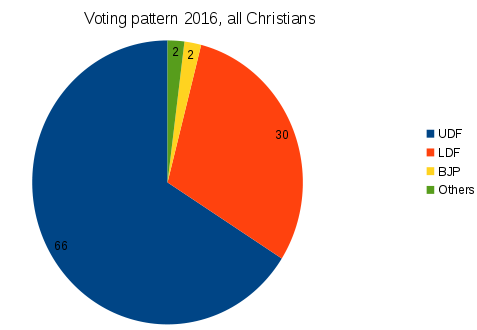 It should be noted that the Christian communities do not vote as a block, as the OBC and Dalit Christians — accounting for 7% of the total population — tend to vote evenly for both fronts, while the 75% or more of the Syrian Christian votes go to the Congress front. It is a different picture when one comes to Congress’ one-third Hindu vote base, which seems to have seen a massive erosion over the past five years. The main Hindu communities in the state are Dalits (15% of total population), Ezhavas (22% of total population), Nairs and others. Taking the Dalits first, there has been drop of 12 percentage points in support, from 38% to 26% over the five years. This translates to a total vote share impact to the extent of 1.8% (12% of 15%). These migrating votes have gone to both the left and the BJP. Next is the Ezhava community, which is numerically the largest in Kerala. The SNDP — the most powerful Ezhava community organization — has declared its public support for the BJP alliance and has plans to join the alliance directly. Among Ezhavas, the swing is a massive 18% away from the Congress, which results in an impact of 4% in terms of total votes (18% of 22% population). Unlike in case of the dalits, all of this 18% freed-up voters have moved directly to the BJP. In fact, the Left front has seen its vote share fall from 57% among the Ezhavas five years ago to 51% in the survey. However, it may be able to reverse the swing if V.S. Achyuthanandan, who belongs to the community, campaigns actively in the election. The third Hindu block is Nairs, who comprise around 11 percent of the population. Here too, the same disenchantment with the Congress is clearly visible. 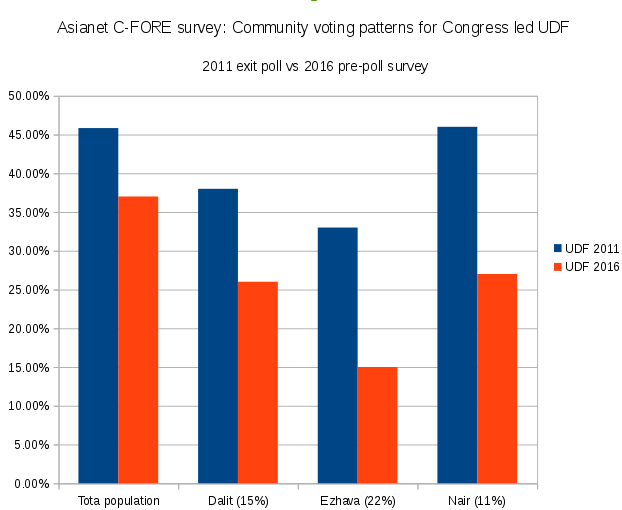 UDF’s vote share has fallen from 46% five years ago to just 27% now — a massive decline of 19%. In terms of real impact on overall vote share, it comes to 2.1%. This is despite the supportive stance of Nair Service Society towards the ruling dispensation. If you examine the charts, you can also see that the Congress Party is now at No. 3 position in all Hindu communities except the Dalits. 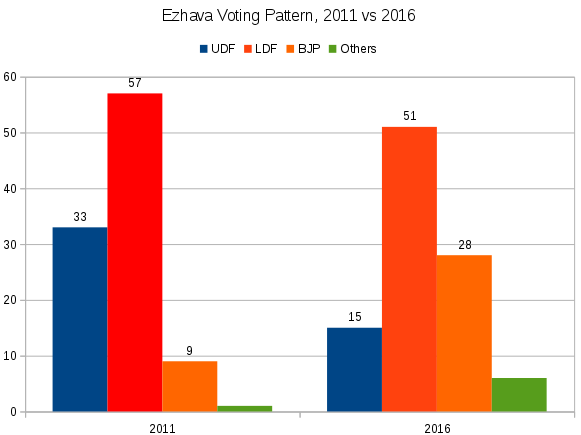 In fact, the UDF’s support among Ezhavas has hit an all-time low of just 15% — almost half of BJP’s support in this community. Overall, the BJP has improved its vote share in the state from around 14% in the Panchayat elections held in November to 18% now. The BJP’s strongest gains are in south Kerala, where it has a vote share of 21%. In north Kerala, it has an 18% share, and in central Kerala, it has 14% support. 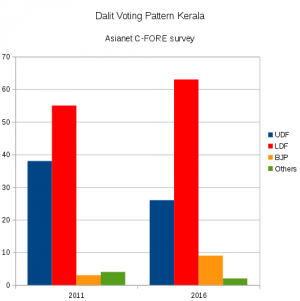 More men support the LDF compared to the Congress alliance. Among men, 43% prefer the Left front, while only 34% of them support the Congress alliance, and 20% support the BJP. Among women, it’s more of an even battle, with 41% supporting the communists and 40% the ruling party and 16% the saffron party. The Congress gets most of its votes from older people, while the BJP gets most of its votes from the new generation. The Left, on the other hand, gets its support from across the age bands. Looking at the crucial 18-25 year segment, 42% support the LDF, 31% UDF and 23% BJP. In the 26-35 year category, 20% support the BJP and 39% the Left. In the 36-50 year category, BJP’s support level falls to 15%, while UDF manages 40% and the Left 42%. In terms of profession, the Left parties get only 14% of the votes of those engaged in any kind of business, while 33% support the BJP and 47% the current ruling dispensation.